When you need complete darkness, you don’t need to resort to just pulling your pillow over your head anymore (Source). Blackout curtains offer you total darkness in your room for sleep, migraines, and even more. In addition, they also help muffle annoying sounds outside as well, which is useful for city dwellers. In addition to sound and light, though, these curtains save energy as well (Source). One of the most common ways that your electric bill goes up is due to your heating and cooling system. Heat and cold air can very easily seep in through your windows without any extra barrier. 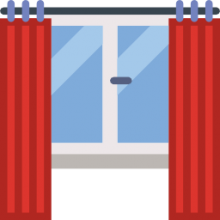 Thanks to the full coverage of blackout curtains and how thick they are, they can protect against most of this invading heat and cold to keep your house at the temperature you want (Source). One thing that customers advise prospective buyers is that they consider if they want new blackout curtains or to just add blackout panels to curtains you already have. They also suggest that when you install them with extra curtain outside the window to keep light from bleeding in at the edges. However, they also advise that you remember that blackout curtains aren’t just black anymore and to not give up on the idea of different colored or even light-colored blackout curtains in your home. All the products we are looking at today are made to block out the light from your home and keep your heating and cooling costs down. However, what about what makes them different? Each of these products are unique and we should take a moment to consider the differences in these products. First of all, let’s look at which of these are blackout curtains and which are blackout panels. The Amazon Basics, Deconovo, and Nicetown options are all traditional blackout curtains. 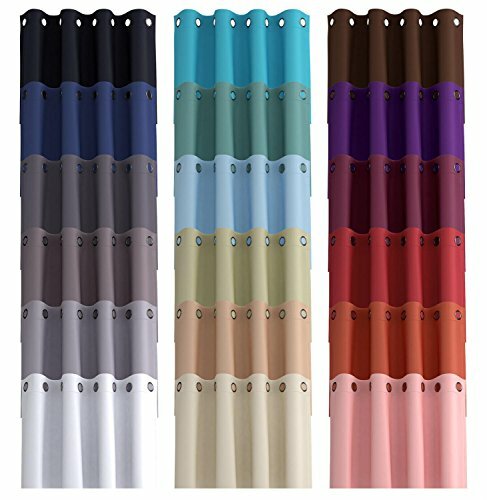 The Amazon Basics curtain comes in black, navy, and beige while the Deconovo option comes in every color you could think of from white to black and even turquoise and even fuchsia pink. The Nicetown curtain comes in a wide variety of colors too, although less options than the Deconovo offers. 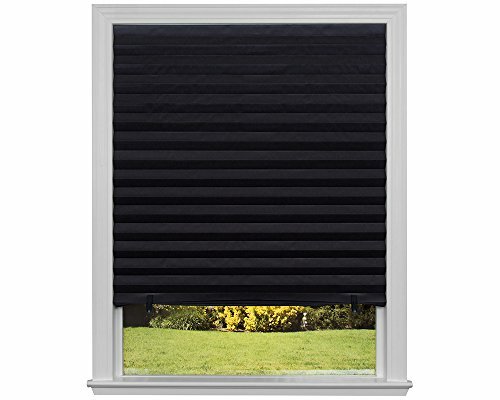 The Redi Shade model that we are considering today is a set of blackout blinds. These work the same way, they just pull up rather than pulling to the side – just like regular blinds and curtains. Miuco is the last choice we have on our list and these are panels to insert into your curtains rather than buying a new set. They come in a variety of colors and allow you to match them to your needs without any problem. First, you need to decide where to place the rod for the curtain to hang from. If you want total blackout and your windows to look longer, you should place the rod a little above the window. Make sure to carefully mark and place your brackets for your rod to set in when it is placed. Attach the drapery hooks on either side of the window with even spacing. Prepare the blackout panels on the top of the curtain. Attach the liners to the curtain. Place the rod in the brackets to hang the curtains. This room darkening curtain set offered by Amazon Basic is affordable, machine-washable, well-made and stylish. Users love the quality of the blackout curtains, but some do note that they smelt on arrival. The Amazon Basic thermal curtain set measures 52” x 63”, and it features two panels, which are made of triple-weave fabric. The curtains are designed to block not only sunlight but also harmful UV ray, and they reduce outside noises. Another great thing about this product is that the rod pockets fit any standard curtain rod, and there are two Velcro ties included for pulling back the curtains. In general, users are extremely satisfied with the functionality and performance of the insulation blackout curtains. A buyer observes that the room darkening curtains cover his 48” x 28” window perfectly and that it takes minutes to hang them up. He adds that the material looks expensive and that the stitching is well-done. Another reviewer states that you could adjust the length of the curtains easily and that they do a better job than more expensive models. He highly recommends them as the best thermal insulating blackout curtains. A user also reports that the curtains are not fancy, but they really block out the sunlight. However, some customers have said that these blackout curtains are too heavy and that the material has a tent-like texture. Some also note that the curtains are too short. If you are searching for top-rated blackout curtain, you might take a look at this room darkening curtain offered by Deconovo. Users love that the curtain is soft and machine washable, but some do note that the package contains only one panel. The Deconovo blackout curtain is offered in three sizes – 42”x 63”, 42”x 84”, and 42” x 95” and it’s made of 100% triple-weave polyester. Moreover, there are six silver grommets on each panel, which will fit most rods. Another great thing about this product is that you have many color options at your disposal. A reviewer comments that Deconovo grommet blackout curtains do a fantastic job of blocking out the sunlight and that they fit her window perfectly. She adds that the material is thick and the seam is well-made and well-stitched. Another buyer states that these thermal insulated curtains keep his room cool in the evening and that he is very pleased with their quality. A user also notes that she is impressed with the quality of the Deconovo blackout curtains and that she highly recommends them. However, some customers have said that this blackout curtain doesn’t really block out the light, just limit it. Some users also note that when they ordered two panels of the same color, they weren’t identical. 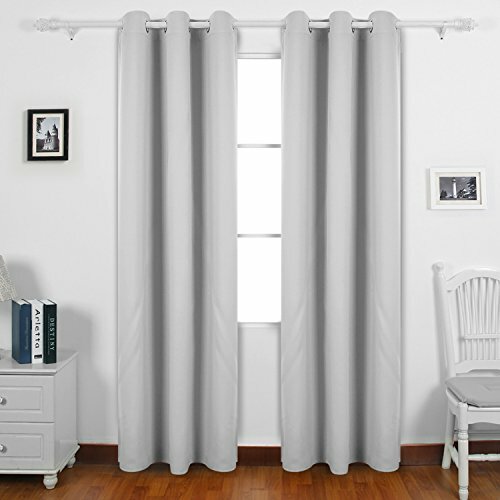 These grommet blackout curtains offered by Nicetown are soft, easy to hang and machine washable. Users love the quality and length of the drapes, but some do note that the color wasn’t what they expected. 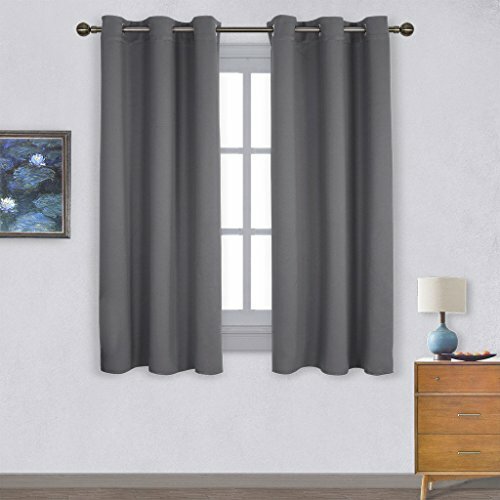 The Nicetown grommet room darkening curtains are available in two sizes – 42” x 63” and 42” x 84” and 14 different colors. They are made of triple weaved polyester to block 85-99% of sunlight and UV rays and to keep heat and chill out of your room. Another great thing about these curtains is that the package contains two panels with six grommets each, which fit standard curtain rods. A purchaser shares that the Nicetown insulated blackout curtains are thick, heavy and soft and that they are perfect for her toddler’s room. She adds that since she has hung up the curtains, her son doesn’t wake up early in the morning and that she highly recommends them. 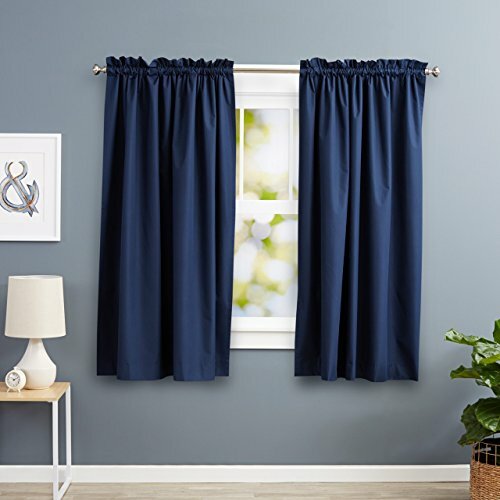 Another buyer comments that these are the best grommet blackout curtains that she has ever seen and that the seams are well stitched and durable. A user also states that the color is accurate and that they keep her room cool in the summer. However, some customers have said that the Nicetown curtains are as useful for blocking light as ordinary drapes because sunlight shines directly through them. Some also note that they don’t keep the heat out and that the color was very different from the provided picture. If you are looking for efficient blackout curtains, you might consider these black pleated paper shades offered by Redi Shade. Users love that you don’t need any special tools to install the drapes, but some do note that the paper is thinner than they expected. The Redi Shade original blackout curtains are available in two sizes – 36” x 76” and 48” x 72” and each package contains six shades. They block 99% of the light, and you can trim them at home to fit your window. Another great thing about this product is that the curtains have clips to raise and lower them, and they are made in the USA. In general, purchasers are satisfied with the performance and usefulness of these blackout curtains, but they do warm that they are not a permanent solution. A customer observes that the Redi Shade blackout pleated paper shades really block the sunlight and that it’s easy to cut them. He highly recommends them to anyone looking for cheap blackout curtains. Another buyer says that it took her ten minutes to cut and tape the paper shades and that she was very impressed with their quality and efficiency. A user also states that the only thing he regrets is not getting these blackout paper curtains sooner and that they do a fantastic job. However, some customers have said that the adhesive is not strong enough and that the paper shades fall easily. Some also say that they don’t recommend these curtains because it’s difficult to raise and lower them. These thermal insulated blackout curtains offered by Miuco are energy efficient, thick, machine-washable, and an excellent choice if you want peaceful sleep environment. Users love the softness and the thickness of the drapes, but some do note that the color is not what they expected. The Miuco grommet blackout curtains are available in three sizes – 52” x 63”, 52” x 84”, and 52” x 95” and in 18 different colors. They are made of innovative triple-weave fabric that blocks up to 98 % sunlight, 100% UV rays and 60% of outside noise. Another great thing about this product is that it comes with two matching ties for free. In general, users have a high opinion regarding Miuco grommet blackout curtains, and they praise their design and efficiency. A buyer comments these thermal insulated curtains are luxurious, thick, and soft to the touch and that he had received many compliments from his friends. Another user observes that the curtains do block the light sufficiently and that they are well-made and durable. He highly recommends them to anyone looking for the best blackout curtains for kids. A purchaser also notes that the grommets are large to fit different curtain rods. However, some customers have said that they find it difficult to get the wrinkles out of the curtains. Some also state that they don’t block the light as well as they expected. If you're interested in purchasing blackout curtains, you're probably looking to naturally darken windows in a room. It should be said that many people enjoy synchronizing their sleep patterns with natural light. But if you work during the night and sleep during the day, it can be imperative to block out light so you get the rest you need. One of the editors here, in fact, tells us that he would tape garbage bags to his windows because his bedroom had wraparound, all-encompassing bay windows, which meant that he would rise at the crack of dawn every morning because of the light. Another advantage, as we previously mentioned, by blocking light your house will be cooler which will potentially reduce utility bill expenses during the summer months. While we have covered curtains extensively, you can also employ temporary window covers with trash bags, cardboard or even aluminum foil to block natural light. Another strategy is to just hang blankets over existing curtain rods- thick wool blankets will naturally screen out all outside light. You can also investigate window film- this will help filter sunlight and even helping to decrease the potentially negative effects of UV rays on your household possessions. While window film will not blackout light, it can reduce glare and be used as part of a natural strategy for darkening windows in your bedroom, living room or any area that is just too bright. Cruising a tech forum, one contributor says that they would stack curtains one behind the other to completely black out their bedroom. Another commented that you can combine a pulldown shade with dark curtains- they recommend Martha Stewart brand curtains and curtain rods. Yet another commenter says that he combined metal blinds with the curtains over which he stapled a blanket to create a completely pitch black environment for quality sleeping.